Our dedicated volunteer, Molly Nemec, forwarded to us the response she received from the Livestock Department of the City of Cheongju, regarding our campaign urging Cheongju to end the illegal dog and cat meat industries. Thank you, Molly. Click HERE to view our campaign. 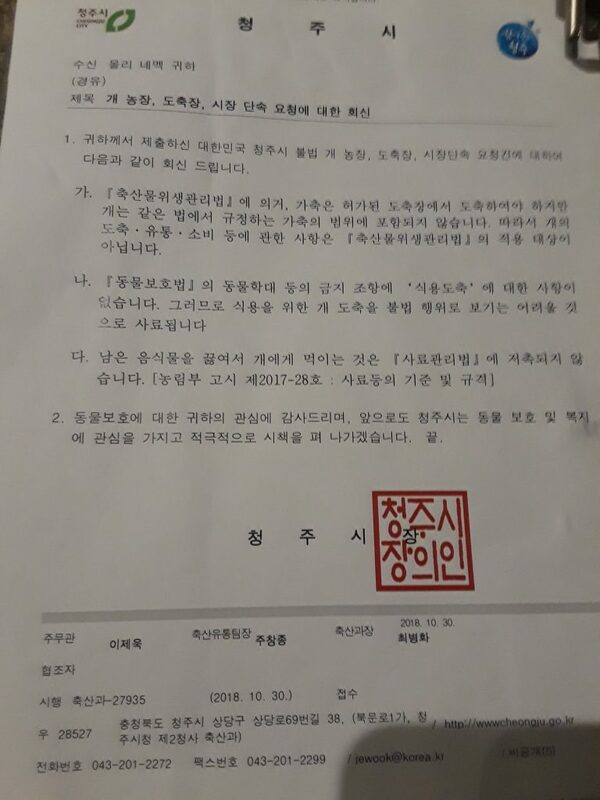 We very much appreciate the City of Cheonjug for taking the time to respond. However, their whitewashed response is both inaccurate and incomplete. This is typical of the responses we receive from the Korean government, which places responsibility for their actions elsewhere. We do not agree with their claims as the dog and cat meat industry violates many Korean laws. Click HERE to learn more. Despite this attempt to gloss over the truth, we feel our campaign has been a success as the Cheongju Government is now well aware that their actions are being monitored by people from all over the world. Let’s keep the pressure on the Korean Government until they aren’t able to stand it any longer. Regarding: Response to your petition to shut down dog farms, slaughterhouses and markets. 1. Below is our response to your petition to shut down illegal dog farms, slaughterhouses and markets. b. In the Animal Protection Action’s provisions prohibiting animal cruelty, there is no provision regarding the “slaughter of animals for human consumption.” Therefore, we feel that it’s difficult to view the slaughter of dogs as an illegal act. 2. We appreciate your interest in the protection of animals and going forward we, the City of Cheongju, will have animal protection and welfare in mind as we actively initiate city policies. So, what they’re saying is they don’t care. It’s time for the rest of the world to step up and place trade embargos against this country. And if the Korean people want us to care about them, then those Koreans who are opposed to this trade better get active stopping it. I know our countries have animal welfare issues, but most (at least of the educated, developed nations) have animal slaughter standards and if they are violated, there are consequences. And when those consequences are not strong enough, there is an outcry from millions of countrymen. Come on Korea, if you can make top selling cars and electronics, you can eliminate this trade. Only an ignorant, depraved society would find it acceptable. Bull crap! They are twisting the law to justify their actions. Total cop out and usually what people do when they know they are WRONG and GUILTY. Let’s keep the pressure on them to do the right thing and expose their wanton disregard for their own laws. Shameful and outright DISGUSTING! what great hypocrisy ! are they serious ? I don’t know what I have to think about these people ? are they completely stupid or completely inhuman !!! I think they are both !!!!! I am disgusted of such an hypocritical response, but I am also aware that if western countries don’t get rid of all cruelties peprpetrated towards animals in general in farms (our way of the breeding and killing is not an acceptable ‘standard’ for me) and even for ‘traditional customs’ (see eg. “Corrida” in Spain , dog races in Irland and UK, etc, etc…..), Korea or any other eastern country will not take us seriously. Western consumers are eager of any kind of technological device (smartphone, cars, etc..) produced – very often – in Korea and for ex. every day I see – above all! – young people wearing garments with real furs (during the ’80 in Italy no young people would have weared a real fur without receiving bad comments. Today it seems being normal). Good manners to persuade people and stakeholders are ok but just a little ‘disobedience’ in my opinion would be more effective…make some alarms ringing..to awaken consciences. Our thinking is today taken into account only in relation to our purchase choices. How do we put more pressure on them to complete the objective? More signers on the petition? Is there someone inside the community there that can be effective? I’m glad we’ve gotten this far, but let’s get it all the way. What resources are most needed. Please repy to me by email. Thank you. Hope your people and country rot in hell for what you do to those dogs and cats. Their day will come, sooner rather than later. We cannot and will not go silently away. KEEP the pressure on them! The world IS watching and we are NOT going away. Whatever it takes I am certain all of us here will take action within our means. Let’s DO IT! Bastards. The next step is cannibalism. The torture is incomprehensible. This must be stopped. Stop cruelty Stop dog/cat meat trade!!!! Shame on you for torturing and eating dogs and cats! We are in 21st century and South Korea isn’t poor. Do the right thing and stop your disgusting culture of eating these poor animals!! South Korea, you need to stop this horror! No animal deserves to be treated with such cruelty. Do you really want your country to be viewed around the world as being a backwards, barbaric and evil “HELL ON EARTH FOR DOGS NATION”? End the Dog and Cat Meat Trade….forever!